This posting explains the Stonehenge Station Stones as marking the locations of the Solstices and Equinoxes in the galactic Milky Way context of ca. 26000 years of "Precession of the Equinoxes". The more modern term for that is axial precession. Some such new terms instituted by the International Astronomical Union would seem to generate more confusion than good. Constantly renaming things is not good science, especially when the history of astronomy is replete with the older terms, which are far better known to everyone. We say that as a dictionary author too. Increased creative but remote "jargonizing" of terminology acts as subject obfuscation, not as clarification. 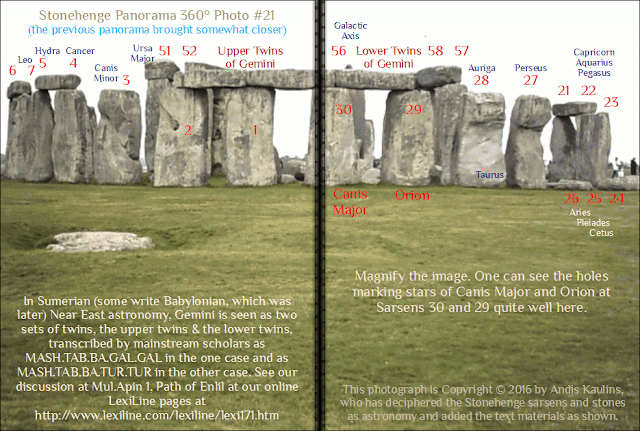 At Stonehenge Decipherment Panorama 15 we wrote previously that these outer stones show that the ancients understood the ca. 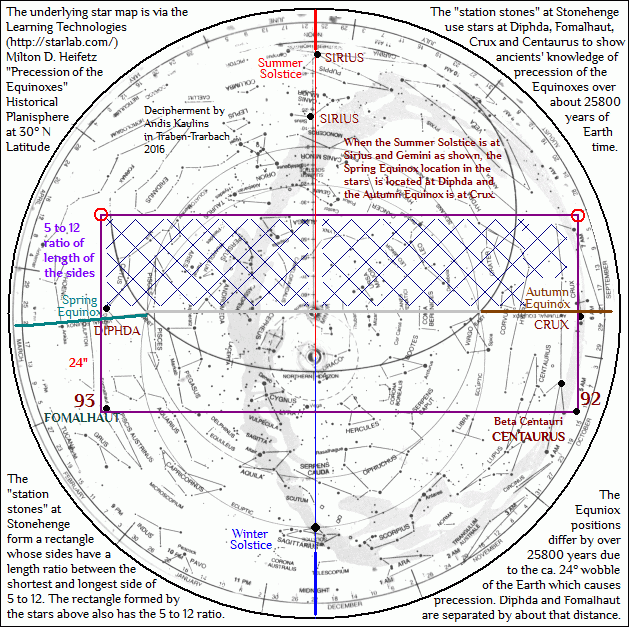 26000-year cycle of Precession of the Equinoxes together with its "galactically" asymmetrical effect on the locations of the Autumn and Vernal Equinoxes in the stars (that is, the stars visible behind the Equinoxes at the time of their occurrence). 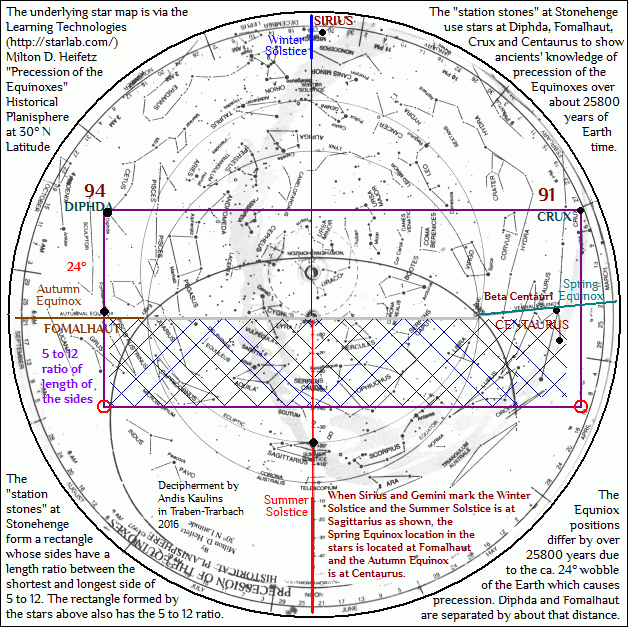 Below are our two seemingly complicated (but in fact easily understandable) graphics explaining the matter and commented in greater detail below, showing how the large rectangle at Stonehenge formed by the four station stones with its sides in a length ratio of 5 to 12 constitute a starry recordation of their understanding of the Precession of the Equinoxes. 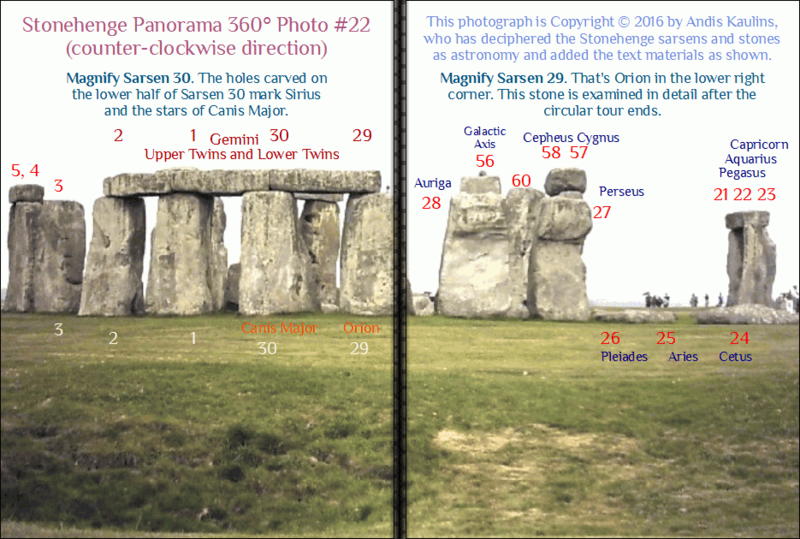 Our images below show that the stars that the ancients used, when connected by lines, also show that same 5 to 12 ratio of the length of the shorter to the longer sides. The reader can measure them himself to check that out. Please note, however, that only two station stones remain and whether the other two ever existed or whether the remaining mounds themselves instead of missing stones are the original markers is unclear. 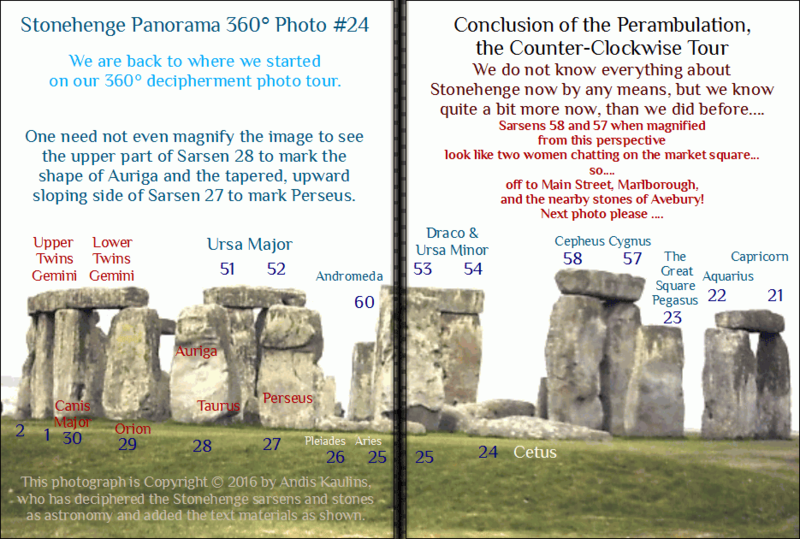 TAKEN TOGETHER -- the ancients have combined BOTH variants into ONE rectangle -- those two variants explain the Stonehenge Station Stones, but it took this decipherer YEARS to figure that out, because the Stonehenge manner of recording that understanding with one rectangle it is not obvious. We first had to understand the galactic nature of Stonehenge to get it right. As for the causes of precession, one can say that the wobble of the earth on its axis of rotation is a "cause", but of course, it is much more complicated than that, which we need not get into here. We refer generally to Milankovitch Cycles for discussion of the Earth's eccentricity, axial tilt, and precession. Astronomers call axial tilt obliquity. As written at the Wikipedia link on Axial Tilt, "Earth's obliquity has varied between 22° 2′ 33″ and 24° 30′ 16″, with a mean period of 41,040 years." How much the builders of Stonehenge specifically knew about "astronomy" in the formal sense of modern understanding is of course subject to discussion, but our decipherment images above suggest clearly that they understood precession of the Equinoxes to be a long-term astronomical, "galactic" cycle involving changes in the seasons respective to the stars, a development that they saw related to a ca. 24° variable of some kind. 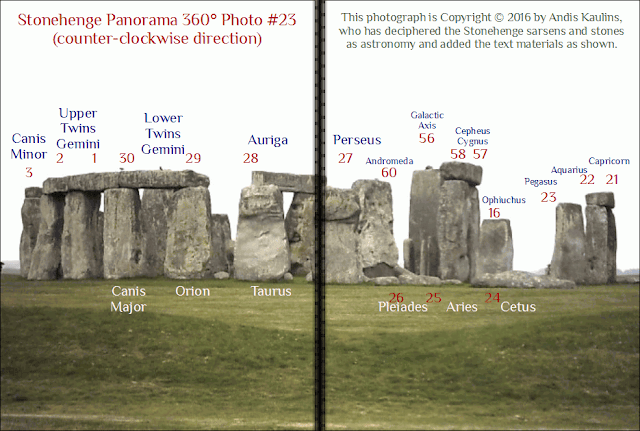 In any case, in our decipherment view, the Station Stones at Stonehenge mark Precession of the Equinoxes, thousands of years before Hipparchus. The matter is clear and we rest our case. 8th - Stonehenge Stone #40g Lead Cover Decipherment - Fish, Shark, Bubbles from the Flippers? Perhaps a Fish, a Shark, Bubbles of Water? 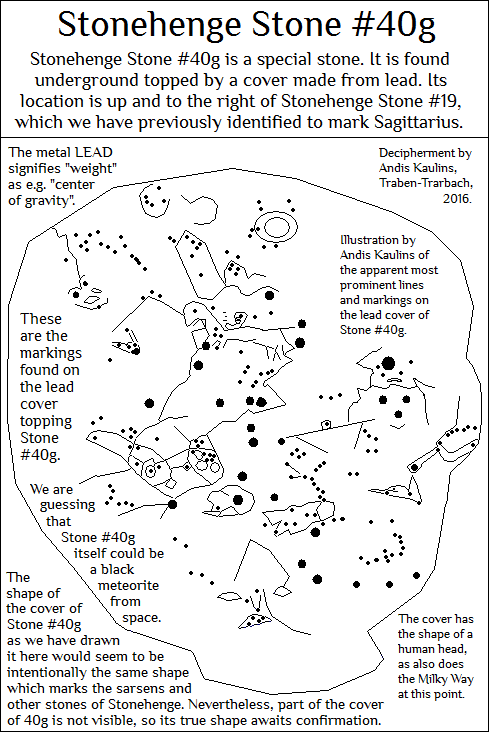 If you want to have some fun and get into the thrill of the entire experience, print out the above image and mark the same markings found in the stars on the stone lead cover image above as we go from one section of the stone to the next in subsequent postings. Now we will enter the markings and stars that are comparable. 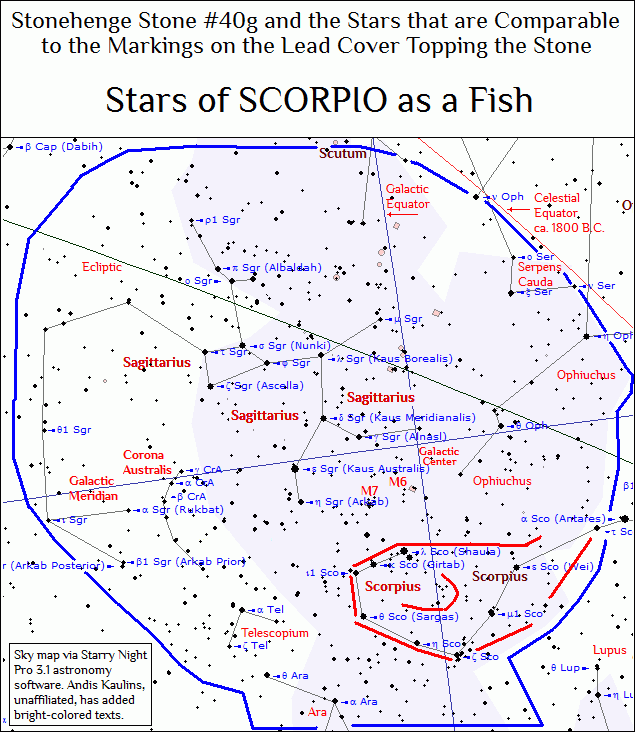 If you want to have some fun and get into the thrill of the entire experience, print out the above image and mark the same markings found in the stars on the stone as we go from one section of the stone to the next in subsequent postings. 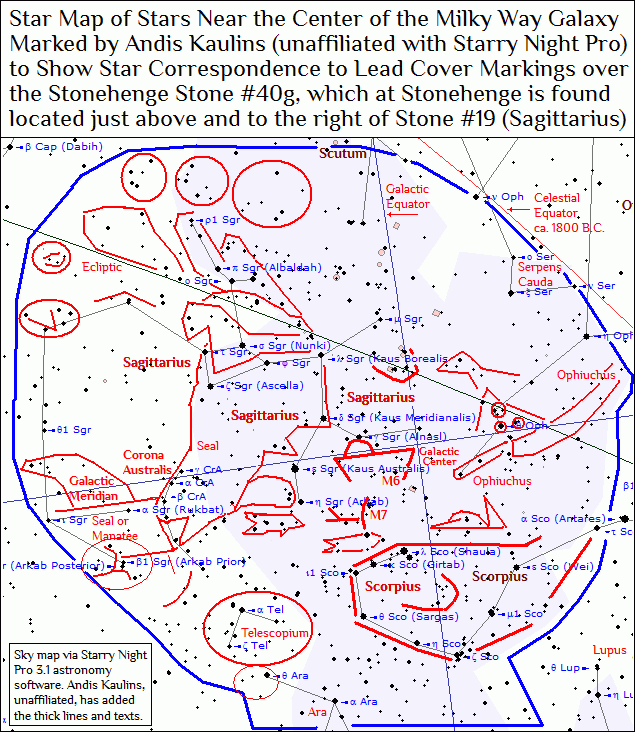 The "lead cover" of Stonehenge Stone #40g marks stars at, near and around the Galactic Center of our Milky Way Galaxy. 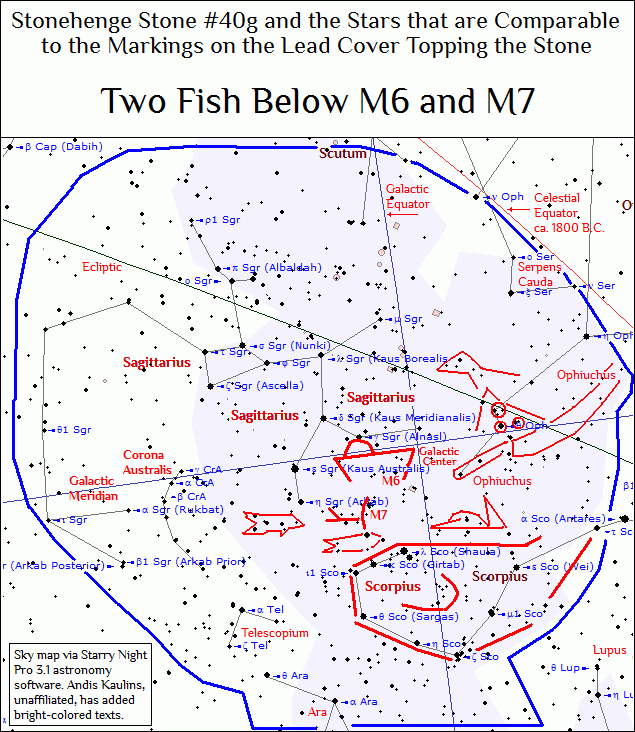 At Stonehenge on site, Stone #40g is located nearby to and to the upper right of Stonehenge Stone #19, which we have previously identified as Sagittarius. That location meshes with the Center of the Galaxy identification. 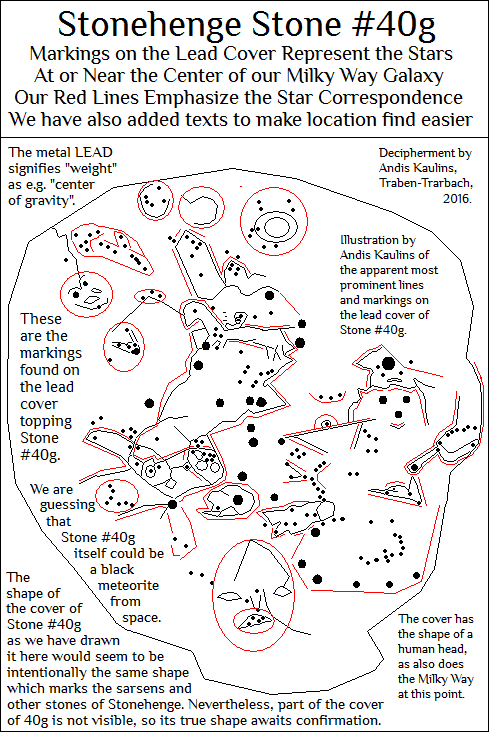 Presumably, the cover was made of the heavy metal lead to show the "weight" of the presumed center of gravity in our universe while the "weighty" stone was symbolically buried underground underneath it. The shape of the lead cover, if we have drawn it correctly, in spite of not being able to see it in entirety, is the shape of a human head facing right. It is identical in concept to the "head shape" of Stonehenge that we previously have identified as being the original shape of Stonehenge and not a perfect circle, as has otherwise long been thought to be the case by mainstream scholarship. The ancients shaped their world view according to themselves and their own physical world, not according to precepts of geometry. That is a modern foible. 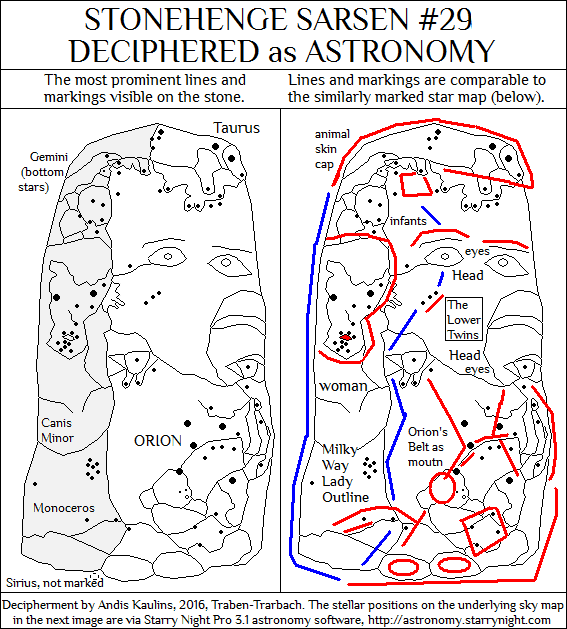 We subsequently show our decipherment of Stonehenge Stone #40g in a series of individual postings which show -- progressively -- how we "deciphered" such a stone by identifying the stone markings and equating them with comparable stars in a sky map clipped via Starry Night Pro 3.1 astronomy software. Of course, you have to know where to LOOK, which is the essence of science, LOOKING and OBSERVING, something the mainstream has done too little. You may have to flip back and forth between postings to see what is happening or print out the image in this posting and then compare it to the decipherment. Stonehenge Sarsen #29 has a very large mark on its back side and then, at first glance, nothing else, but close inspection shows very faint markings on the stone which via graphic software can be identified as marking the stars of Perseus and surrounding stars, thus portraying a family with mother and child, both skillfully integrated into the shape of the Milky Way at that point, plus a pet dog, equally skillfully integrated into a hole in the Milky Way by shape, plus the presumed father of the family as the weaver on an ancient weaving loom running from top to bottom on the stone representation. We first show the most prominent lines and markings visible on the stone via our graphic software (Paint Shop Pro 7) and next to that image the sky region of comparable stars via a clip via Starry Night Pro 3.1 astronomy software. 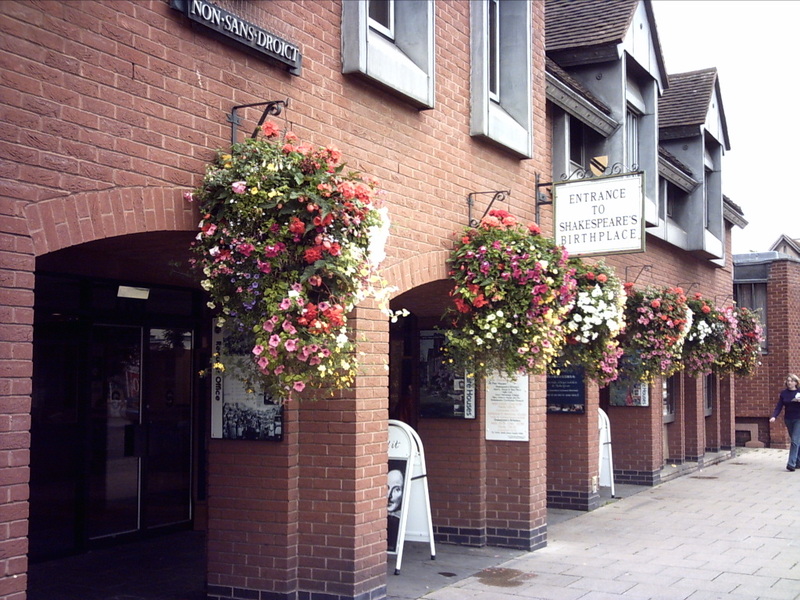 The first image is the simple version. The detailed version is the second image. The third image shows a comparable stone-marked loom from Neolithic USA. The henge-inward side of Stonehenge Sarsen #29 represents Perseus, Aries & Triangulum as father "weaver" with a loom. 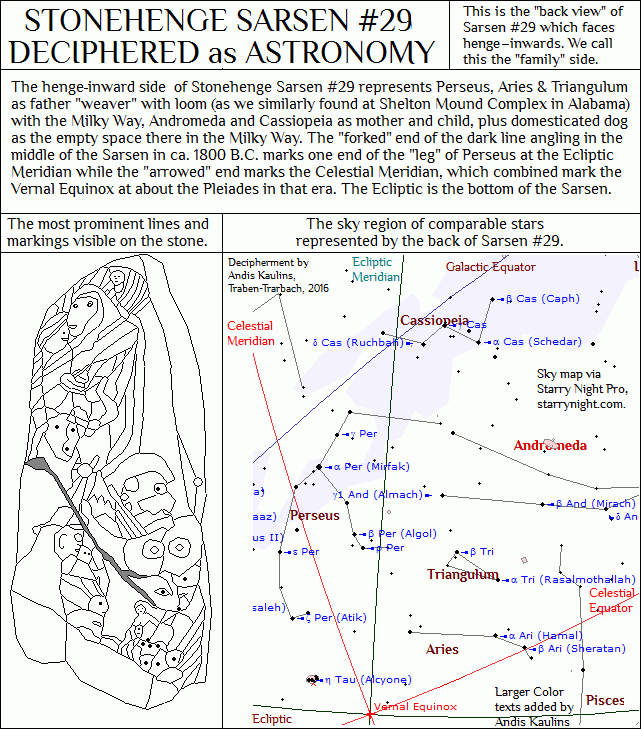 We found a similar loom represented at Perseus and surrounding stars at the Shelton Mound Complex in Alabama, USA, with the Milky Way, Andromeda and Cassiopeia as mother and child, plus domesticated dog as the empty space there in the Milky Way. The "forked" end of the dark line angling in the middle of Sarsen 29 in ca. 1800 B.C., around the time estimated for the building of Stonehenge by archaeologists, marks one end of the right "leg" of Perseus at the Ecliptic Meridian, while the "arrowed" end of that angling dark line marks the Celestial Meridian, which combined mark the Vernal Equinox at about the Pleiades in that era. 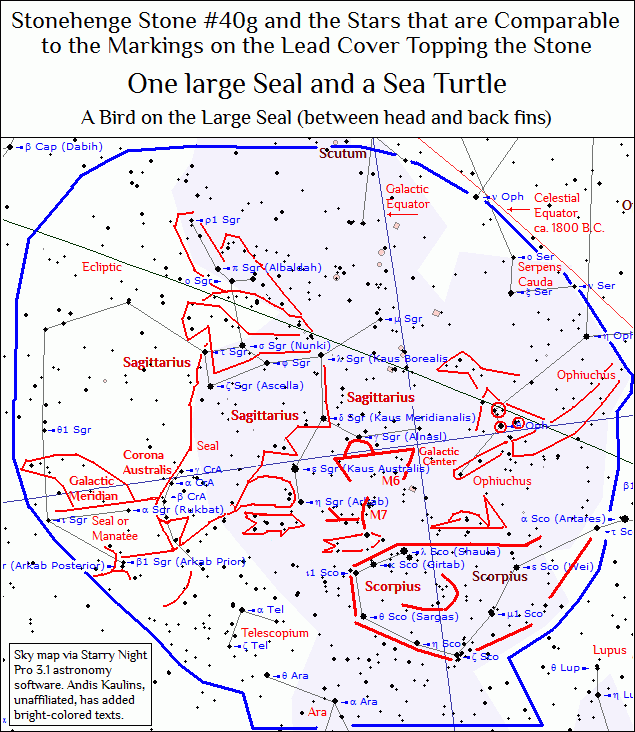 The Ecliptic is then marked by the bottom of Sarsen 29 on the ground. 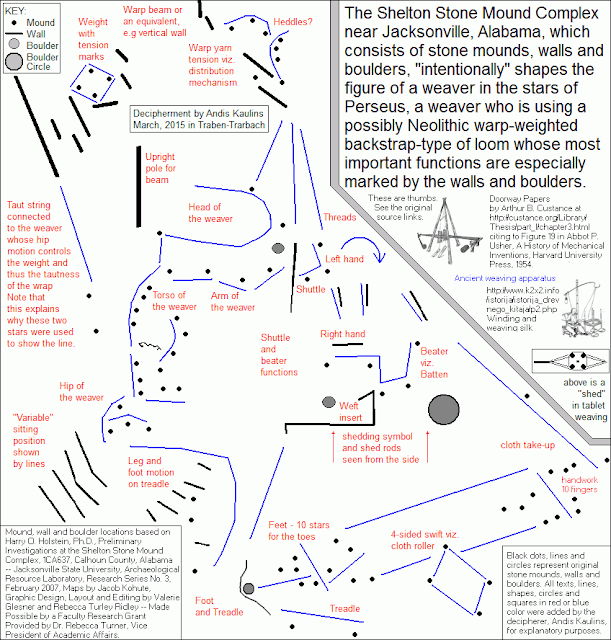 We identified Perseus and surrounding stars as representing a weaving loom already in our book Sky Earth Native America (see the links further below), finding such an apparently Neolithic warp-weighted backstrap-type loom represented by various markers at the Shelton Stone Mound Complex near Jacksonville, Alabama, USA. Evidence of ancient seafaring? Surely. Markings on stone so closely resembling an ancient loom, which is already quite a piece of complicated machinery in the Neolithic (Stone Age) era, are not likely to appear on a stone by chance, nor could the present decipherer ever hope to imagine or draw such a piece of equipment by scratch, never having had any previous loom contact whatsoever. Rather, much fundamental background reading had to be done to find out exactly what the ancients were representing and how it worked as one of man's greatest inventions. Stonehenge Sarsen #29 is the farthest right stone of the phalanx of four "lintel-topped" sarsens at the front of the Stonehenge henge on the main Stonehenge axis. 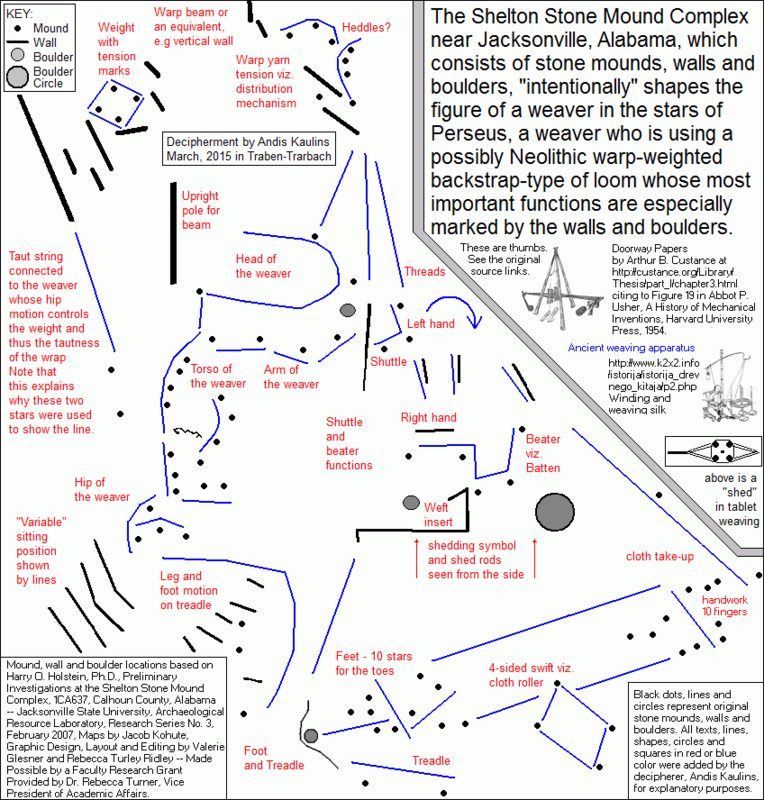 We show our decipherment of the front side of Sarsen #29 below. 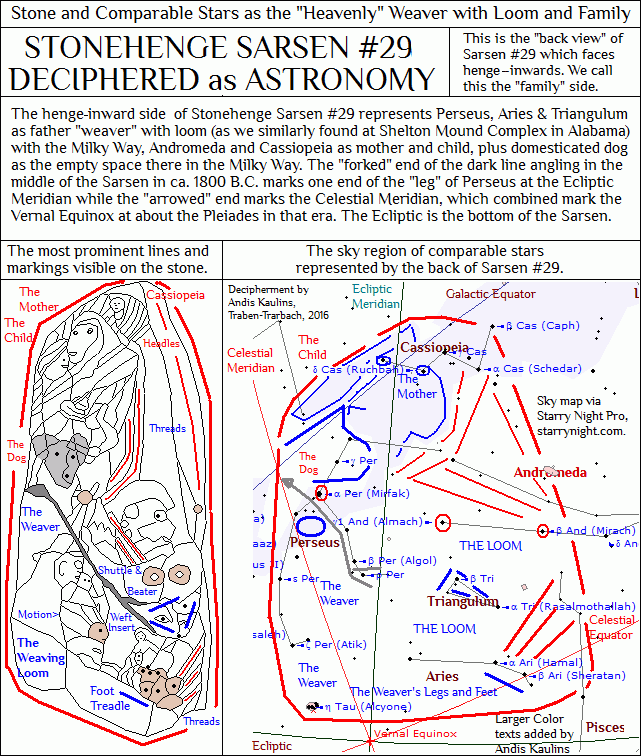 As can be seen from the above decipherment, Sarsen #29 skillfully integrates not only the stars in this region of the sky but also the shape of the Milky Way into the sarsen sculpture. The Milky Way in this region of the heavens has a female shape which we refer to as the "Milky Way Lady" to which each reader can add their own imagination. The Milky Way is shown by the solid darker "ribbon" in bluish-lavender color in the image above. We have marked the figure of the lady by thick dark blue lines. Sarsen #29 presents the same lady on its left front face and we have marked the main points of similarity in red both on the sarsen stone as well as on the underlying sky map. 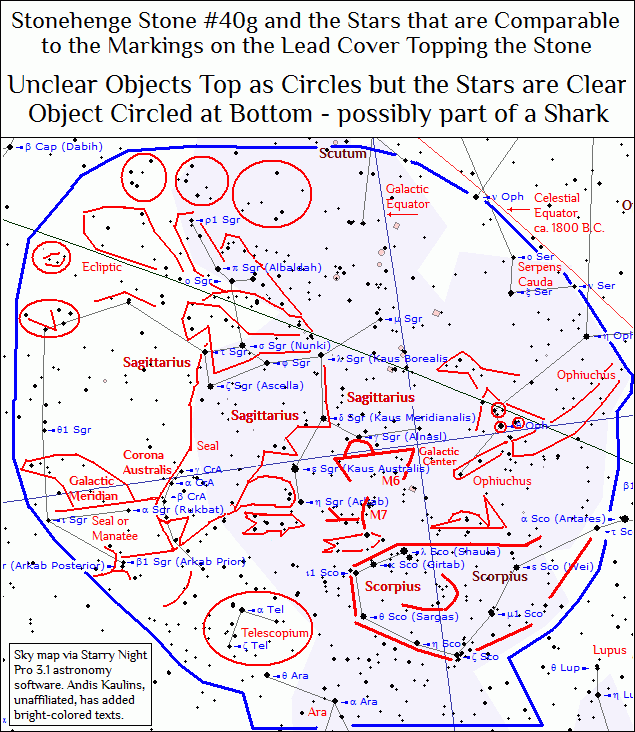 As usual, our underlying star positions are a clip from our standard astronomy software, Starry Night Pro 3.1. We stick to the older version because it better suits our purposes than the recently purchased Starry Night Pro 7, which appears to be great for avid telescope users, but appears for now to be somewhat less suited to our simple research purposes. Perhaps we are just accustomed to what we have been using for so long. The right side of Sarsen #29 viewed from the present perspective consists principally of two male heads, one above the other. We have marked them in red only without a blue outline. The top head is crowned by the kind of full-body animal skin cap often seen by us in megalithic sculpture. 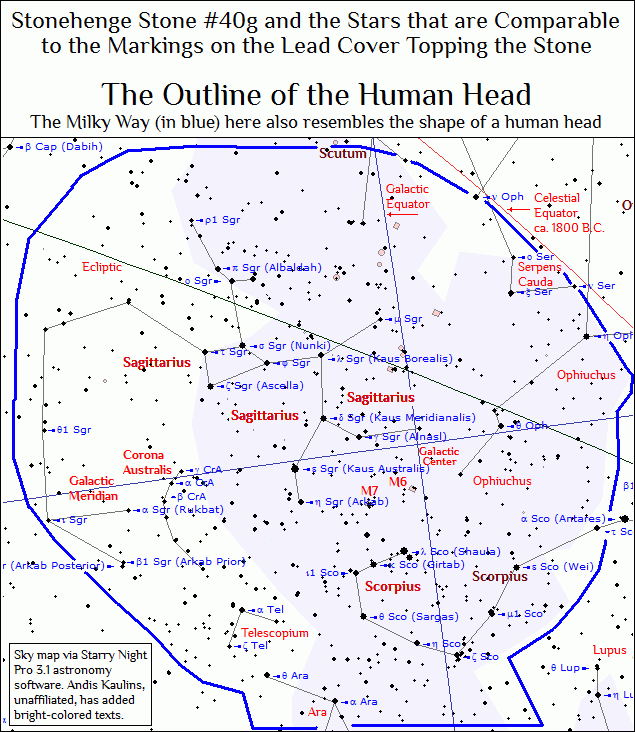 The markings at that crown of the head are stars today assigned to Taurus. The top of Sarsen #29 marks the Galactic Meridian and the crossing point there of the Galactic Equator. That is the "opposite" Milky Way point to the crossing again of the Galactic Equator and Galactic Meridian 180 degrees removed near the stars 3 Sagittarii viz. 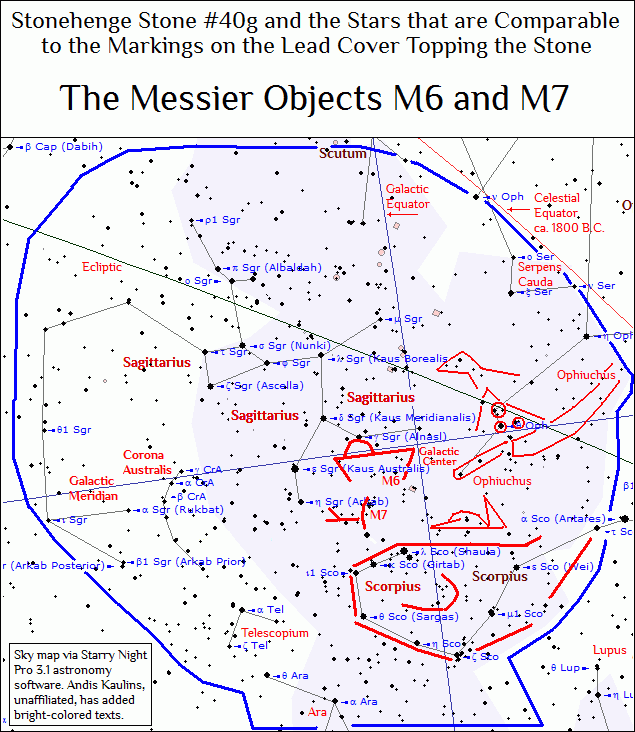 Gamma Sagittarii (the tip of the arrow of the bow of the archer, Sagittarius) as well as 45 Ophiuchi, and Messier Objects M6 and M7 between Sagittarius and Scorpio. That is the location of the Center of the Milky Way Galaxy. That is surely where the ancients placed the galactic center in their basic skywatcher observations. 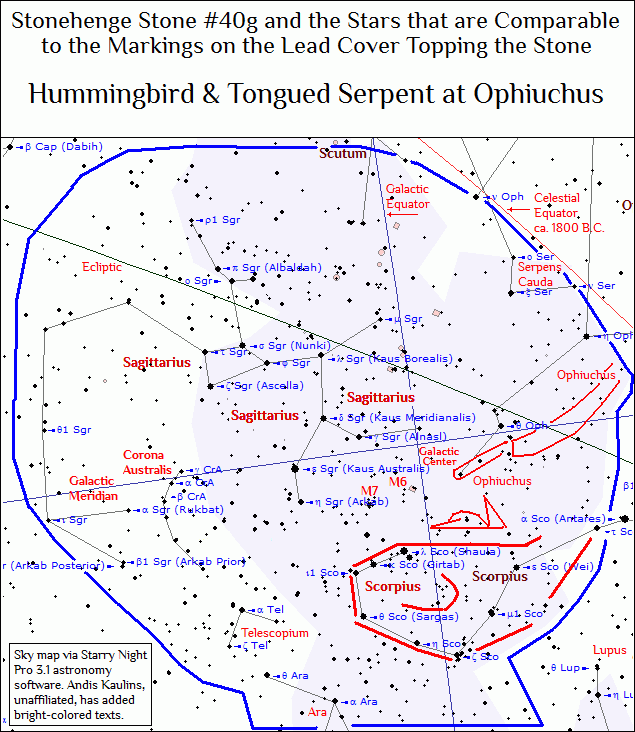 We will look at that galactic center in our decipherment of Stonehenge Stone #40g and meet those above stars again. 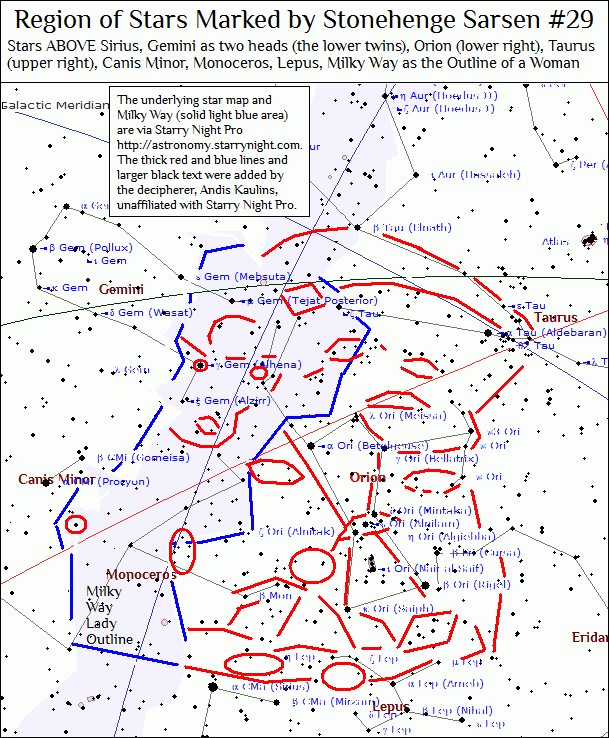 Although the two heads surely represent the "lower twins" of Gemini, the stars assigned in historical research to the "lower twins" by modern scholars actually correspond to the position of the head of the lady in the Milky Way, with her lower half marked by stars of Canis Minor and Monoceros. The beard of the lower of the lower twins is marked in part by stars of Lepus.